A cancer journey – our new normal is ahead of us! So it is been over a month since my last post. Time for a little update. Last post Rick came off the clinical trial. The immunotherapy drugs worked great on his cancer cells … but went a little nuts on his pancreas. Thankfully, Rick went from very high levels of lipase (pancreas levels) to almost normal in just a few weeks. The wonders of steroids. Ya gotta love ’em. Of course, Rick also got some kind of a wicked cold that included a horrible cough. It hung around for weeks and is now almost history! So our next step? Dr. Campbell pulled a cancer pill out of his oncologist tool box. Inlyta … take it twice a day. It does much the same thing as one of the immunotherapy infusion drugs. It cuts off the blood supply to cancer cells. One of the most unusual side effects of the drug … there are others … is that Rick’s hair is going to turn white. Well, he isn’t far off so that one is totally not a problem. “Pretty soon I’ll look just like Col. Sanders,” Rick laughed. If the Inlyta does its job, it looks like our visits to MDA will slow down. Praise Jesus on that one! So once we get rocking and rolling … major scan day tomorrow to set a benchmark on where he is … we will be visiting Dr. Campbell every six weeks and scans every three months. Don’t tell anyone … but we could be getting our life back! A cancer journey – what a couple of weeks! So when last we chatted, Rick missed the last two immunotherapy infusions of Nivolumab due to rising lipase levels. It was thought that perhaps having a little break from a couple of infusions, his pancreas would cool down. Just to make sure that was happening, Rick’s oncologist, Dr. Campbell, had Rick come in for bloodwork last week, our “off” week, right before Christmas. Rick and I totally expected it to go down and that we would skip down the yellow brick road to the 8th floor for an infusion the following week. Not! His lipase more than doubled to 919. Three hundred is considered the top of normal. The only outward appearance of side effects was his itching had increased the past month … a lot. Imagine the worst case of chicken pox … and then double it. Before we left, Dr. Campbell prescribed a round of steroids, lasting six days, which he believed would help “cool things down.” We also met with a GI to see if the lipase increase could have anything to do with the gallstones that showed up on his recent MRI. An ultrasound was unremarkable and no physical symptoms pointed in that direction. Rick is really attached to his gallbladder and the good news was he could keep it! So today would be a big day. Our normal MDA day starting with early morning bloodletting, oncology and hopefully infusion #13. Did the steroids cool things down? Would Rick have an infusion today? But wait. While chatting with our adorable research nurse, Jenna, she casually mentioned a term called “tumor burden” while reading from her computer screen. I learned the number represents the total size all the tumors, except the primary and bone tumors. They virtually roll them in a ball like play dough and place a number on it. Rick’s initial scan in February of this year was 12.2 total cm of tumors, with an additional 10 cm of the kidney. By the September scan, tumors had been reduced to 4.7 cm, and of course, no kidney tumor. That is a reduction of 61% excluding the kidney tumor. Numbers fascinate me … especially ones this good. Shows how far we have come to be sure. This morning, I walked into the oncology appointment with severe indigestion. Can a plain old bowl of Rice Chex do that? I never have indigestion. The sourness left the minute Jenna said Rick’s lipase had dropped to 281 … totally normal. About 20 minutes later we were headed up to the eighth floor for Rick’s infusion. We are taking this cancer fight one day at a time. God is good … all the time. We went on a “thank you” tour today at MD Anderson Hospital. It was our very small way to personally thank all those people who have “touched” Rick on our many visits over the past 11 months. We still have a long way to go … over a year of treatment on his immunotherapy clinical trial for clear cell kidney cancer. He is doing great! This will be our first Christmas at MDA and we wanted to let them know that we noticed all those special people who work at MD Anderson Hospital. Yes … we certainly noticed things like the quality care … their easy smiles … the incredible patience with us … the simple but powerful kindness of employees that always put us first. Don’t even get me started on their caring volunteers. I owe some lady a small box of tissues. It is why I ordered several dozen Christmas cookies from my neighbor, the awesome Marie. She makes these amazing sugar cookies. I mean, they are so beautiful to look at and taste great too. I have to admit … I got the idea of a “thank you” tour from President-Elect Donald Trump. If he can do it … so can we! But let me back up a day. On Wednesday, Rick had his CT and MRI scans. On the trial he has scans every three months. Since they were afternoon appointments, he did them all himself. I am so proud of Rick. Navigating hospital visits are not easy for him. Today we met with the adorable Jenna, our research nurse, and Dr. Campbell’s PA, the lovely Simi. The news was great. Liver tumor is still shrinking and affected bone areas still healing. Unfortunately, Rick’s lipase is still rising. It was Simi that also broke the news. The MRI showed gallstones. Geez … gallstones? Really? It may also be the reason for the rise in lipase. So there was no infusion again today. I am certain a game plan will be evolving regarding the gallstones. So instead of going straight home, we had enough time to stop by to see our daughter, Katie, and hold our little grandson. Ben also got to hold a cookie! Wouldn’t think of leaving them out of our “thank you” tour! So I know you want to know just who got cookies. We started in valet parking. The lady was so surprised, I also got a bear hug. The four receptionists on the 7th floor of the Mays building also got cookies. I think we made Clarence’s day. What a nice man. Clarence checked us in and made Rick’s wristband. I think he shook my hand three times. Next came the lady that took Rick’s vitals. What beautiful eyes this young lady has. In Dr. Campbell’s office, our research nurse, Jenna, got two cookies. We couldn’t leave out one for her daughter! Simi received four … one for each of her children. Dr. Campbell received four, and Mae, his nurse, one cookie. Geez … after that we traveled to the 8th floor. Even though there was no infusion we dropped off cookies to the receptionist in the Peach Suite, the nice lady that does vitals there, and the infusion nurse we always ask for … the awesome Elizabeth. She has magic fingers when it comes to finding a vein. Before we left cookies also went to a guard, the cashier who checked us out at valet parking and the valet dudes that brought our cars. Almost forgot … two more cookies to the elderly couple from Bellville waiting for their car. They really looked like they needed cookies. 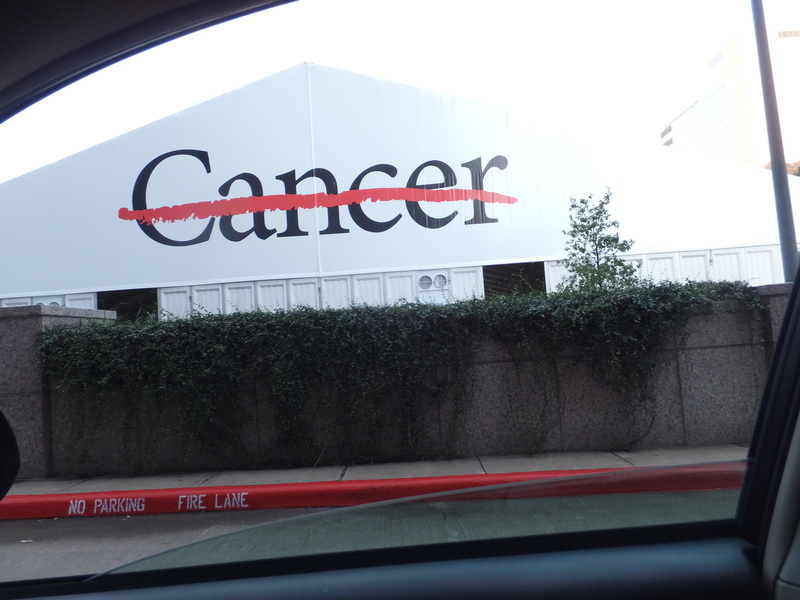 Just spreading the love … like the folks at MD Anderson do everyday. Thank you MD Anderson … and Merry Christmas! Since maintenance immunotherapy infusions are pretty routine stuff, I’ll be writing about them two at a time. Both infusion number 8 and 9, two weeks apart, started at 6:30 am with bloodletting. Only now since we are so far into the clinical trial, they only take about five vials instead of 15. Then we hang out for a couple of hours and wait for test results before meeting with clinical research peeps and oncologist. After bloodwork is blessed, we head up to 8th floor to wait for infusion. Usually back at home by 2 or 2:30. We can do this! Infusion #9 was a pretty darn special forty-eight hours. Our daughter, Katie, went into labor with her second babe the day before the infusion. When I got the news, it took most of the morning to get my ducks in a neat little row. I quickly packed a bag, got a quick kennel reservation for Lulu, and a spot for Mimi at her respite house before heading into Houston for a few days. There was a high alert placed for our son-in-law’s parents, Nana Jana and Pee-Paw to assist with little Jacob. They drove in from the Dallas area. Yes … it would take four grandparents to take care of one little toddler! Jacob is a busy boy. Rick and I picked him up from daycare and then out to dinner. As Houston is not our usual arena, we relied on Yelp for dinner spots and almost wound up taking little Jacob to a sports bar. A quick call to our daughter in labor and we settled into a more appropriate dinner spot. The following morning, also infusion #9 day, grandson Baby Ben arrived … 8 pounds, 7 ounces! Rick started his day at MD Anderson. After dropping off Jacob at daycare, I hurried to get my paws on our newly born Baby Ben. Such a handsome little guy! I am in serious love! Later in the day, I arrived at MDA to supervise Rick’s infusion. Afterward, we headed around the corner to see Baby Ben. I have an adorable photo of Pop-Pop wearing his hospital bracelet from MDA holding Baby Ben all tightly wrapped up with his hospital bracelet. All in all, an interesting infusion #9 we will never forget! Prayers and MDA made this magical moment possible!